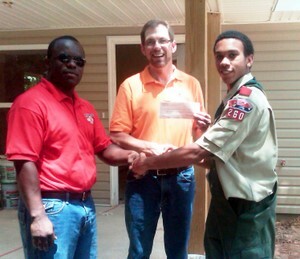 R hyan Smith, 15, an Eagle Scout candidate of Americus, has taken the Scout’s Oath to a new height. As part of his Eagle Scout project, Smith decided to volunteer with the Fuller Center for Housing to help paint a handicap-accessible duplex on Elizabeth Street for Thaddeus Harris and Chuck Davis. The handicap-accessible duplex will be home to both men who are in wheelchairs. Davis has cerebral palsy and Harris was paralyzed in an traffic accident. Smith became interested in the Eagle Scout project when he and his family volunteered at this duplex in March, putting up walls inside the duplex. He said he saw how the two handicapped men were overwhelmed with joy when they saw a young teen volunteer his time to help them. To begin the project, Smith met with Kirk Lyman-Barner, a director of the Fuller Center for housing, conducted Internet research, and met with other members of the scout council to seek approval for the project. Smith raised $1,034 through donations from churches, businesses, family and friends, i.e. Mount Olive Baptist Church, Big Bethel Baptist Church, Lebanon Baptist Church and Wood’s Swingin’ Wings; painting supplies from Sherwin Williams, Shiver Lumber Co., Tuggle Lumber Co., Planters True Value Hardware, Lowe’s of Albany, and Home Depot of Albany. Smith’s Scout Troop 260 and their parents volunteered to paint the duplex. Lyman-Barner said, “Rhyan’s project is extremely helpful to the Fuller Center and to the deserving two gentlemen. We cannot thank Rhyan enough for all of his dedication and hard work. Through this process, Smith says he learned life skills, networking skills, money management and business skills. He also learned a lot about leadership, which will come in handy when he pursues his career after graduation in 2013. This story also ran in the Americus Times-Recorder and can be viewed here. Learn more about what the Americus-Sumter County Fuller Center for Housing is up to here.